On the eve of the final state approvals for Atlantic Yards, developer Forest City Ratner, apparently threatened by a prepared but never filed civil rights lawsuit that jeopardized the pending joint venture with a crucial new investment partner, has agreed to accelerate the construction of affordable housing in the project to finish all 2250 units by 2025, rather than 2035 as state documents would permit. That's significant progress on the affordable housing issue, implying (though not guaranteeing) an accelerated deck over the "blighted" Vanderbilt Yard, and implies government commitment to continued housing subsidies. As the project approvals were pending in 2006 and 2009, Forest City long pledged a ten-year buildout, and project benefits were always calculated on that timetable. Company CEO/Chairman Bruce Ratner later claimed that ten years “was never supposed to be” the timetable, as the buildout was market-dependent. Only the first of 15 residential towers is under construction, though Forest City has said it plans to start three towers within a year, and the Times now reports four start dates through July 2015. The announcement comes on the heels of a court-ordered environmental review that concluded—to the ire of some local advocates—that the delay in housing buildout to 2035 would not cause any adverse socioeconomic impacts not previously disclosed. And it comes as the joint venture, in which the Chinese government-owned Greenland Group is set to buy 70% of the project going forward, is supposed to close. Most will see it as significant progress, getting a schedule commitment--approaching the original promise, plus a five-year delay since the project was re-approved in 2009--previously unachievable via the state process. Still, it’s a victory with flaws, given an oversight solution satisfying to most but frustrating to some close neighbors, who over the decade have amassed considerable skepticism the developer and Empire State Development, the state agency overseeing/shepherding AtlanticYards. Also, though the changes were pushed by groups that sought more project transparency, the agreement was negotiated in secret and its outline (though not terms) made public as a fait accompli, less than a day before ratification by the board of Empire State Development. It's unclear what role, if any, elected officials have had. The pressure to accelerate the timetable—and include significant penalties for delays—came not from Forest City’s longtime housing partner, Bertha Lewis (formerly of ACORN) and the Mutual Housing Association of New York, but rather from groups in the BrooklynSpeaks coalition, set up to mend but not end the project. Area Community Council (next to de la Uz), and others. Those groups, including the Fifth Avenue Committee and the Prospect Heights Neighborhood Development Council (PHNDC), were preparing a lawsuit arguing that the delay would discriminate against black Brooklynites facing ever-increasing rents as the time to finish the project continued to extend. The agreement includes a pledge by several groups not to sue. Longtime project opponent Develop Don’t Destroy Brooklyn, which along with BrooklynSpeaks member groups won the lawsuit that forced the environmental review, was not involved. However, the agreement only partly meets the BrooklynSpeaks goal of improved oversight, and the solution has provoked one key PHNDC constituent group, the Dean Street Block Association, to leave the council, arguing that its concerns, notably the continuing impacts of construction (subject of these letters), were not being sufficiently addressed. The Atlantic Yards site, on the south, borders Dean Street. Thus, while the agreement surely will be seen as a kumbaya moment regarding this long-contentious project, given that it includes civic groups from gentrifying neighborhoods not part of the 2005 Community Benefits Agreement, the neighbors most affected by—and most vigilant toward—the project have not signed on. The authority will also establish a 14-member board responsible for ensuring compliance with the agreement, and for monitoring the mitigation of community impacts during the construction period. Its members will be appointed by the governor, the mayor, elected officials and the Brooklyn borough president. However, it's not clear that how much teeth the subsidiary will have, which is apparently one reason why the Dean Street group dropped out. At a special meeting on 24 June 2014, the Board of Trustees of the Park Slope Civic Council voted to join the proposed complaint as a named plaintiff, to support a settlement in lieu of filing the complaint should one be agreed to by the parties thereto, and to agree to release any and all claims, known or unknown, in respect of the subject of the proposed complaint, as of the date of a settlement should one be agreed to. This settlement represents a significant advance for the whole community surrounding and affected by the Atlantic Yards project. The accelerated delivery of affordable housing will benefit thousands of Brooklynites at a critical time, and we believe this is a step in the right direction in its terms, with great potential to be executed as structured. Moreover, the community will gain a degree of project oversight for the first time. The Park Slope Civic Council strongly supports affordable housing in our neighborhood and throughout Brooklyn and applauds this positive settlement and the consistent and dedicated hard work of the parties that brought it about. The settlement agreement, according to the Times, includes "hefty financial penalties if the developer fails to meet the agreed-upon goals." That was not made public until this morning. They include "Liquidated Damages of $2,000 per month for each Affordable Housing Unit." For a building of 300 affordable units, that's $600,000 a month, or $7.2 million a year. Some wiggle room remains, since ESD Board Materials cited the possibility of "Unavoidable Delay" and "Affordable Housing Subsidy Unavailability or Market Financing Unavailabilty," already present in the Development Agreement signed in 2009. Third, ESD will require developer to build affordable housing as it constructs market rate housing. In particular, ESD will amend the Development Agreement to require that a minimum of 35% of all units for which construction has commenced at any time will be Affordable Housing Units until construction of 1,050 Affordable Housing Units has commenced. Thereafter, this percentage requirement may drop to a minimum of 25. However, by 2025, FCRC must complete 2,250 Affordable Units, as set forth above. If at any time before completion of 2,250 Affordable Units developer falls below the 35%/25% threshold, it will not be able to complete a single market rate unit until the threshold is again met. Fourth, ESD will direct all Liquidated Damages to the New York City Housing Trust Fund, a fund administered by the NYC Department of Housing Preservation & Development. "The new agreement specifies that a portion of affordable units would be for low-income families of four that make $48,000 or less, moderate-income families earning up to $88,000 a year, and middle-income families earning up to $104,000." While Mayor Bill de Blasio said the configuration would serve a "more diverse range of families," it unclear if those income levels differ from the longstanding arrangement. Nor is it clear whether the developers will meet or come closer to the goal, as stated in the Housing Memorandum of Understanding signed with ACORN, of having 50% of the affordable units, in floor area, be two- and three-bedroom family size units. The first tower falls far short of the goal. Nor does the agreement address other BrooklynSpeaks goals, including changes in the design of open space (presumably somewhat achievable) or shrinking the project (less achievable). Beyond the potential of the lawsuit to threaten the Greenland deal, the new timetable likely reflects multiple factors: the interest and willingness of Greenland to build quickly; the strength of the Brooklyn real estate market; and, perhaps, an implied if unspecified commitment by the mayoral administration to fund not just the next buildings but more going forward. The Times portrayed it as not only Greenland's willingness to build but also "Mr. Cuomo’s desire to impose a timeline on a long-sputtering project sponsored by New York State, and Mayor de Blasio’s eagerness to make significant progress on his vow to create 200,000 units of affordable housing." The new timetable does not necessarily mean the entire project would be finished by 2025, at least if some towers, as currently planned, would contain exclusively market-rate buildings. But a 2025 finish could mean the platform over the railyard would be significantly accelerated, thus curing the clearest example of the blight otherwise dubiously found by the state and helping knit together neighborhoods. The platform need not be started until 2025 under current documents. If affordable housing is front-loaded, it is possible for the 2250 subsidized units to be delivered by 2025 without the platform built in full. It's not clear if there's any new timetable to build the deck. The original plan, as suggested in 2006 documents, was to build the platform early in the process. This new plan continues to emphasize construction on terra firma. According to the Times, the next two towers to start, Building 14 on the southeast block and Building 3 on the arena block, will contain all affordable units, a total of 600, which suggests that the de Blasio administration has already committed financing. The notion of an all-affordable building is a change in plans. While that would hasten the goal of getting subsidized housing built quickly, it would also retreat from the 50% affordable, 50% market mixed-income buildings promised at the start and potentially leave more towers as all luxury units. For example, as Forest City’s housing partner Lewis said at a July 2006 meeting, “When we started to talk about it, there was a principle”: every building would be mixed affordable housing and market-rate housing. In 2007, as the state’s 421-a tax break was being revised, Forest City was able to get a “carve out” exempting its project and thus allowing tax breaks for the entire project even if specific buildings did not contain affordable housing. It may be easier to finance or plan a building with no affordable housing. Surely people paying top dollar for condos would rather not live with the hoi polloi. After submitting detailed comments on the draft scope a year ago, we were deeply disappointed to find in February of this year that ESDC dismissed our request that it reconcile the 15-year project delay to which it agreed in 2009 with the project’s goals of eliminating blight and providing what the 2006 FEIS accurately described as “much needed affordable housing. Before the ESD board approved the Supplementary Environmental Impact Statement (SEIS) earlier this month, Gib Veconi, treasurer of PHNDC, blamed mostly the state, which extended the timetable. "You today should not approve an SEIS that will clear the way to cement that date until you are certain that the project as it's reconstituted now has meaningful mitigations that protect the vulnerable populations in the communities around the project from the risks of extended delay," Veconi said. 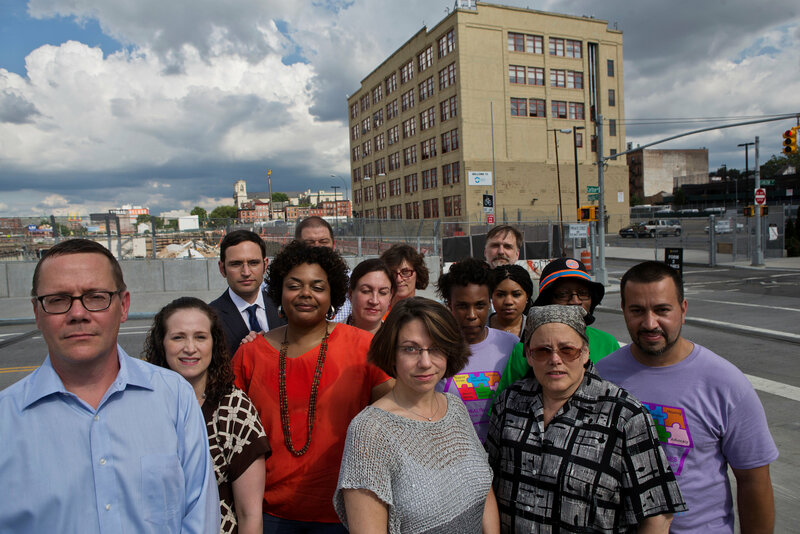 He warned that “the Brooklyn Speaks organizations are not prepared to stand by and watch the state continue to be allow our communities to be exposed to the risk of project delay." Last November, a meeting at Brown Memorial Baptist Church in Clinton Hill, sponsored by the Fifth Avenue Committee and Brown Community Development Corporation CDC, offered a petition to "block the sale of land our tax dollars paid for to a foreign company with no stake in producing Affordable Housing for Brooklyn." While that petition wasn’t successful, it apparently helped further plans for the lawsuit. There's a 50% preference in a housing lottery for residents of the local community boards, so local tenure is crucial. de Blasio, a longtime Atlantic Yards supporter with ties to Lewis and developer Ratner, was long expected to give Atlantic Yards a boost. In negotiations with Forest City, Deputy Mayor Alicia Glen agreed to provide a cash subsidy of $11.75 million for each of those buildings, in exchange for 600 units of affordable housing. 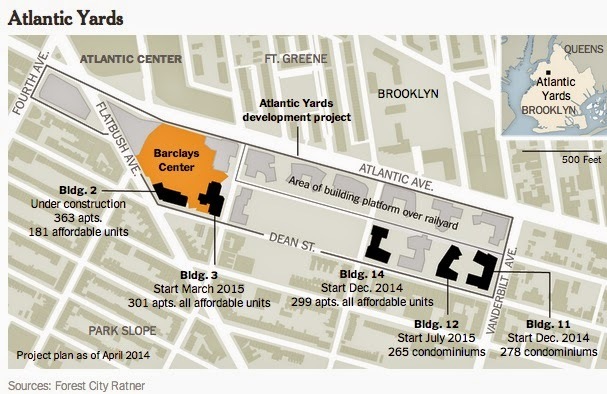 That deal represents a major improvement on Atlantic Yards’ first, still uncompleted building, Ms. Glen said. In that instance, she said, the Bloomberg administration invested $11.6 million for only 182 units of affordable housing. “We’ve fundamentally changed how developers are working with the city to deliver affordable housing,” she said. I'm not sure it's that simple. First, the buildings benefit from both cash subsidies and also tax-exempt housing bonds from the New York City Housing Development Corporation. It's not clear if the new towers are getting the same amount of bonds per unit. Second, while it seems like the direct cash subsidy has been cut in half, that means Forest City likely will build more towers that are all market-rate (aka luxury) units. That's an implied benefit to Forest City, if not a direct subsidy. It's also not clear if the subsidies and tax-exempt bonds, on a per unit basis, are commensurate with those for other projects around the city. She added that Forest City has had to deal with a variety of obstacles, “including the Great Recession and numerous lawsuits.” Forest City has already spent over $525 million on the residential portion of the project, which involves building a new Long Island Rail Road storage yard and building a platform overhead for apartment towers. First, note that the $525 million has not been used for the permanent rail yard (just a smaller, temporary one) nor the platform. And while Forest City has spent a significant sum, it's gotten more than $270 million in direct subsidies and far more in tax breaks and other indirect subsidies. Also, the obstacles were not merely those mentioned by Gilmartin. How about the developer's unrealistic plans to build the project, including the railyard, in ten years, as well as the parent company's unwillingness to offer continued funding.